I have very fond memories of my father preparing this dish and following the recipe of Julia Child. I can’t think of a better recipe that combines booze with dessert, Chabernet style. Preheat the oven to 425 degrees Grease the bottom and sides of a 1 1/2-quart souffle dish with 2 tablespoons of soft butter. Sprinkle in 3 tablespoons of sugar, tipping and shaking the dish to spread the sugar evenly. Then turn the dish over and knock out the excess sugar. Set aside. In the top of a double boiler, beat the egg yolks with a whisk, rotary or electric beater until they are well blended. Slowly add the sugar and continue beating until the yolks become very thick and pale yellow. Set the pan over barely simmering (not boiling) water and heat the egg yolks, stirring gently and constantly with a wooden spoon or rubber spatula, until the mixture thickens and becomes almost too hot to touch. Stir in the Grand Marnier and grated orange peel and transfer to a large bowl. Set the bowl into a pan filled with crushed ice or ice cubes and cold water, and stir the mixture until it is quite cold. Remove it from the ice. In a large mixing bowl, preferably of unlined copper, beat the egg whites and the cream of tartar with a clean whisk or rotary beater until they form stiff, unwavering peaks. Using a rubber spatula, stir a large spoonful of beaten egg white into the egg-yolk mixture to lighten it. Gently fold the remaining egg whites into the mixture. 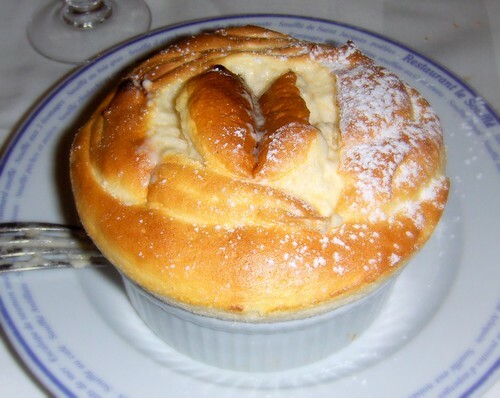 Spoon the souffle into the buttered, sugared dish, filling it to within 2 inches of the top. Smooth the top of the souffle with the spatula. For a decorative effect, make a cap on the souffle by cutting a trench about 1 inch deep 1 inch from the edge all around the top. Bake on the middle shelf of the oven for 2 minutes, then reduce the heat to 400 degrees. Continue baking for another 20 to 30 minutes, or until the souffle has risen about 2 inches above the top of the mold and the top is lightly browned. Sprinkle with confectioner’s sugar and serve it at once.